Vedanta was a substantive influence in the early philosophy of the Brahma Kumaris, before their own distinctive understanding of the spiritual world developed in the post-1958 period. Read a summary of Advaita Vedanta by Patrizia Heise to understand the Brahma Kumaris' early thinking. What we now know as the Brahma Kumaris World Spiritual University began as ‘Om Mandli’ (“sacred circle” or “gathering of those who chant om”). Om Mandli, sometimes called "the yagya" (sacred sacrificial fire), was nothing short of a spiritual revolution in the North West of the Subcontinent. The great national tension that surrounded Partition helped to shape the character of the Mandli that eventually left the new Pakistan and moved to India. As well as the unrest within the greater nation of India, they was the added burden social violence in their local community, as their yogic practice and spiritual philosophy jeopardized the Hindu tradition of marriage and the role of women. The knowledge and practices empowered young girls and mothers to become leaders and spiritual teachers. Lekhraj Koobchand Kripalani was born on the 15th December 1884 to the son of a schoolmaster in Hyderabad Sindh. Starting his career life as a carpet salesman, Lekhraj gradually entered the diamond trade becoming a well-known jeweler and a respected member of his community. Lekhraj was married (to Jashoda) with five children (including daughters Palu Motriam Muhki, Surya Kumari and son Narain Kripalani) when he started his spiritual life. 1931 Lekhraj Koobchand Kripalani (47), in partnership with Sevakram Koobchand Daswani (of similar age) are successful diamond merchants of the Bhaibund community running the 'Lakhi Raj - Sevak Ram and Sons' jewelery business in Calcutta, India. Although they work in Calcuttta, they both maintain family homes in Hyderabad (Sindh). Bhai Lekhraj has a number of gurus from whom he seeks spiritual guidance. Lekhraj has great respect for these spiritual guides and often gives them alms and support at their request. Over the next few years, which mark a period of great change in Lekhraj's life, his relationships with the gurus become progressively important, before becoming completely immaterial. 1932 - 1934 Bhai Lekhraj becomes deeply contemplative. Distracted from his work, he spends a great deal of time talking to his mind, endeavoring to understand its habits and behavior. At the advice of one of his gurus, Lekhraj starts holding satsangs (religious gatherings) at a small place that belongs to his uncle (Bherumal Kirpalani, aka Vishwa Kishore). The Bhaibund men are away for months and often years at a time conducting trade. As satsangs are considered a good use of ones time - he invites the women and children to attend. Lekhraj reads the Gita, the most esteemed Hindu scripture, while others listen. January 1934 Lekhraj’s uncle - Kaka Mulchand - dies. Kaka Mulchand was a great philanthropist and was dearly beloved by Bhai Lekhraj. Kaka's character had a great influence on Lekhraj, so his passing was a decisive moment. Lekhraj then began to turn his mind more deeply to spiritual matters. To the great dismay of Bhai Sevakram - his childhood friend, business partner and confidant - Bhai Lekhraj enters vanprasth (retirement) prematurely, at the age of 49. Due to his deepening spiritual inquiry Lekhraj is just 50 when his revolutionary spiritual journey begins. He sells his half of the business for a nominal price to pursue spiritual study. This occurs while they are at the peak of their professional success and their worldly lives. NB. In key publications, Lekhraj's birth year is incorrectly cited as 1876. This coincides with the retirement age of the 'ideal man' stated by scriptures (Manushastra), which is nearer to 60. 1935 The Om Mandli community starts chanting "Om" during their gatherings. Young girls and mothers enter trance states of meditation and have prolonged visual and ecstatic experiences. Many see Lekhraj in the form of Krishna and starting clinging to him and calling out. Word spreads and the community and their families wonder what is going on at these satsangs. remembering (from 30 years later). The first clear knowledge accepted within the community is that of a 5000 year, endlessly repeating cycle of four ages (with a transitional and key fifth confluence age). Cyclic time is a concept present in many faiths and cultures. However, according to Lekhraj's son Nayarayan who was in the Om Mandli from its inception, it was Lekhraj who determined the time period of 5,000 years, the distinct time intervals and the connection between time and caste. Although we can't be certain, it seems that the cycle came into Lekhraj's mind powerfully through his own contemplation and reflection. Lekhraj may have reasoned that souls came into the Cycle of Time and travelled through the four ‘castes’ of Brahman, Kshetriya, Vaisha and Shudra. These ‘castes’ are identified as belonging to specific eras of human existence; Golden, Silver, Copper and Iron Ages. Outsiders begin calling Lekraj’s satsang ‘Om Mandali’. The community adopts the name. Insiders begin calling Lekhraj "Om Baba". 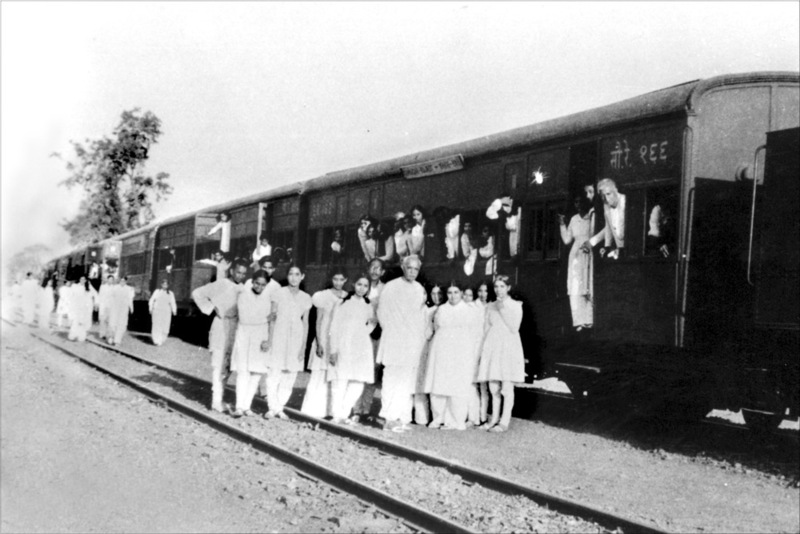 July 1936 Lekhraj goes to Kashmir for one month, but remains for three, motivating some of the sisters to carry on the satsang on his absence. "We children were crying day and night. Where did my Kiridhar Gopal (Krishna) go? We acted as if crazy, calling out 'Baba, Baba' and we were deperately distressed. For those months whenever we saw Baba Shri Krishna would appear". (Prakashmani, Page 7, Bestower of Fortune). During Baba’s absence, the yagya members continue to experience trance and visions. Upon his return, Baba feels that there must be another power working within him, although exactly what or who this power is remains unclear. The community who are completely enamored of Baba, and the experiences they are having through him, begin to see him as Divine Father incarnate. The community starts expanding, and so Lekhraj starts holding formal satsangs at his larger family home, Jashoda Niwas, in Hyderabad. They start the practice of chanting "om" at the end of the readings. Members continue to have visions of Dada as Vishnu, Krishna and light. Lekhraj has three powerful visions at different times during 1936; One of paradise accompanied by a feeling of joyful calm, one of destruction accompanied by terror and sadness and one of a variety of Hindu gods (Vishnu, Krishna, Jagannath, Badrinath and Kedarnath) acccompanied by a voice repeating "You are this". At this early stage, those in the Mandli call Lekraj 'Baba', 'Om Baba', 'Bhagwan' and 'Mandli Mata'. Lekhraj establishes a branch of Om Mandli in Karachi. Reports in Adi Dev that Baba had a vision of points of light descending from the Soul World seems to be incorrect. There was no understanding of the soul as a point of light until at least the late 1950s in the literature. There was also no understanding of soul world until the 1950s, according to interviews with original members. Also, note the quote below from Sakar Murlis (versions spoken by Brahma Baba between 1965 and 1969) that mention the visions of destruction, paradise and gods, but not of souls: "When he saw that he was going to become an emperor and he also had a vision of destruction and then a vision of his kingdom, faith was instilled in him that he was to become the master of the world" (Sakar Murli 16/10/2000). "As well as having the vision of the four-armed vision of Vishnu, there was also a vision of destruction. I realised that I was to receive the kingdom and that destruction would be taking place in just a few days." (Sakar Murli, 27/03/1999, page 89, quoted in Satyam Shivam Sundaram). 1937 There was broad and clear understanding that Lekhraj was God incarnate or a form of God. "One early morning in 1937 I was walking with my father when we met Baba... He was laready known to us... I experienced lightness at once, and felt there was God in him. I thought at the time: he is my real father; he is God. I had been looking for God for a long time, and felt at last I had found God." (Janki, Page 12, Bestower of Fortune). October 1937 The Trust is established, whereupon Lekhraj hands over his wealth and property to a group of 9 - 19 sisters. He remains an advisor. In the ensuing months, picketing and protesting from close family members begins, in defiance of the perceived anti-Hindu approach of women being empowered and leading celibate lives. Early knowledge is limited to the Cycle and the Soul. There is a clear perception that destruction is imminent – there will not be another Dilwali. The earliest understanding is as follows: During Golden Age and Silver Age the consciousness will be I am Creator of Creation (unity). During Copper Age and Iron Age the consciousness will be I am God but the Creation mere illusion (duality). There is great intoxication with the knowledge of the Drama and it is referred to in beautiful ways including the Eternal Creative Play and the World Bioscope. Early yagya members understand that there is a confluence of the old and new time periods but the Confluence Age per se, is not yet understood. The understanding of the soul is distinctly different to the BK Raja Yoga knowledge of today. In the 1930s and 1940s the soul is understood as ‘Aham Brahm Asmi’ or ‘I am God,’ or 'I am the element of divine light'. The understanding of the soul as a jyoti lingam (or a sentient thumb-shaped point) takes nearly 20 years to become clear. The knowledge of the soul as jyoti bindu (or a sentient living point) will take even longer. In the Gita, Brahma is both manifest and unmanifest, the ocean and a thumb. In the 1930s there is no clear distinction between God and the self or between the self and the realm of light known as ‘Brahm’. Despite their lack of intellectual understanding, members have great spiritual confidence that they are the same souls of the previous kalpa (cycle of time), that they are the chosen ones, and they are the key to the world’s liberation from sorrow. The young women, children and men experiment with practicing different states of mind. The great love, awareness, belonging and purity sustain them through many years of scant knowledge. October 1938 Due to violence and protesting, the community moves to Karachi and changes their name to Rajsuva Asvamedh Avinashi Gyan Yagya (the indestructible sacred fire of knowledge in which the horse is sacrificed). They live in a small number of houses, the main one at Clifton Beach, with a herd of small herd of 8 to 10 cows. Nevertheless, the protesting follows them. As do a series of court cases brought by members’ families to try to disband Om Mandli. March 1939 The Tribunal that included Charles Lobo (editor of the Sindh Observer and also the Indian Judge who had previously sided with Om Mandli) banned the Om Mandli on the basis of Om Radhe's (Mama's) testimony that affirmed Baba's questionable intimate activities with women. However, they didn't enforce the ban. Om Mandli went to Clifton and remained quiet. Around this time Allah Bux, the Chief Minister of Sindh, recommended the Mandli change their name to sidestep further legal problems. Om Mandli was a name attribute to the community, by the larger society. For the first time the community adopted their own name: Brahma Kumaris Ishwariya Vishwa Vidyalaya (Brahma Kumaris World Spiritual University). That name remains to today. 1939 - 1942 Experiences of bodiless samadhi increase amongst everyone. They experience merging with the Brahm element. Many report experiencing ‘light upon light’. Early pictures (drawn in the early to mid 1940s) show ‘Infinite Divine Light’ written around the Cycle and the Tree, as this is what they frequently experience in their meditation. Dada writes notes in the morning and Mama reads them to the class. Trance messengers share their experiences daily so that others may learn from them. The community has stopped reading the Gita and notes down what is being spoken through Brahma, recognizing it as distinctive. The legal and social difficulties the community faced served to strengthen their resolve. Absolutely convinced that this new understanding is the key to global liberation, adn that they are the instruments to bring this to fruition, they craft letters to world leaders like Gandhi, Princess Elizabeth, King George and the Viceroy and Vicerene of India to start informing the world of the need for radical change and spiritual awakening. 1942 - 43 The role of Brahma is clarified for the first time. A young Sister, Pushpa, goes into trance, and then a whispering voice (that we now understand to be the influence of Shiv Baba) speaks through her. Dada refers to this ‘personality’ as Piyu, meaning the Beloved. No-one had heard this voice before, so it generates some interest, particularly in Dada, as it confirms his intuition that there is another power, another personality, responsible for the experiences he and others are having. They begin to call the written notes that Dada writes ‘Piyu Vanis (versions of the beloved)’. Piyu gives Dada the name ‘Brahma’ and clarifies the role of Brahma as creator. With this revelation, members start referring to him as Prajapati (Lord of the World) God Brahma. This confirms their bhakti understanding of Dada as a form or incarnation of God Vishnu. Brahma Baba though, believes in the distinct personality of Piyu. However, that does little to convince others. Nevertheless, one can presume that, at some point during the early years, Brahma Baba feels he is indeed God Brahma, due to the strength of the experiences that others are having through him and the power of his own insights and experiences. 1943 During this period Brahma Baba relies heavily on a series of trance messengers to facilitate his own understanding and churning. Knowledge is still clearly Manmanabhav (let your mind be with God) Madhiajibhaw, ie Aham Brahma Asmi or Aham Chaturbhuj (I am the creator of creation/ Vishnu/ God). In 1943 Gulzar Dadi has the first experience of Avyakt Brahma in the Subtle Regions, introducing the knowledge of the Subtle Regions for the first time, and the understanding of three distinct realms or ‘worlds’. The tendency is to compare the knowledge gained through insight, trance, and visions, with the stories of the Gita, which is still the frame of reference for their experiences. From the 1940s until the early 1950s Avyakt Brahma is a source of understanding, knowledge and support. Avyakt Brahma is understood to be the complete form of Brahma, but the importance of that role is not fully clear until 1969 when Sakar Baba becomes Avyakt and the combined form of Bap and Dada emerges. Pictures from the 1940s created through trance show ‘Infinite Divine Light’ (the omnipresent essence of God), written clearly around the Cycle and Tree. These pictures also identify Divine Father Gyan Surya (Brahma Baba) and Divine Mother Gyan Chandrama (Mama). The second picture of the tree has arrows indicating how Brahma becomes Vishnu, so Krishna, so Narayan, which is absent in the first picture. The difference in the pictures indicates the gradual development of knowledge. During these years, while WWII is going on, they reason that this is the very same Mahabharat war spoken of in the scriptures, and the old world will be destroyed in 1950. This also fits with the famous story of the 13 years of exile the Pandava’s experienced. They felt there would be 13 years between the official beginning of the yagya, and the total demise of the old world. During the time of Piyu, there was one of the first experiences of dissent in the community. Sister Pushpa, the chariot of Piyu, began to feel that she should be given special treatment and acknowledgement because of her role as the chariot. While the Divine character of Piyu was speaking through her, Baba and Mama gave her special food, fresh clothes to wear and a special seat. However, when Piyu was not there, Pushpa was treated the same as all the other children. Sister Pushpa, and a handful of others, known as 'the gossip group' or 'the golden group' felt this was unfair. They ultimately left the community. One of those sisters was the biological sister of Dadi Janki, Chief Administrative Head of the Brahma Kumaris. 14 Aug 1947 Partition of India. The Om Mandli community maintains silence, to develop their yoga practice and also for their own protection. The high wall that Baba had built to protect them from the violence through the protests, continues to serve them during the social and political violence of Partition. 1948 Shiv Baba speaks through Brahma Baba directly (not through Pushpa) saying “Shivohum” in the same whispering voice that had been associated with Piyu five to six years earlier. Dada Anand Kishore understands there is indeed the personality of God present, but this clarity and perception is not common. To some it becomes clear that Brahma is not God, that in fact no human being can be God. Some start becoming aware of a different personality. During this second coming of Piyu, some report that - from time to time - there is a more intense light on Brahma’s face and forehead. Others say Brahma’s face was always shining, and others that there was no remarkable difference. 1949 Brothers Vishwa Rattan and Chandrahas are given the task of illustrating new posters that were visualised by young sisters in trance. One trance messenger sister is shown a vision of a Tree that contains all religions and Brother Vishwa Rattan is given the task of illustrating it. TheCycle came after that by Chandrahas, as well as the Trimurti. The Cycle and the Tree are sent to the Monarchy of England, which is how they were found by researchers in the British Library almost 60 years later. The posters identify Brahma as Prajapati God Brahma. Baba corrected, finalised and authorised all printing, so the knowledge contained within these original documents and posters are our best indication of their understanding of the time. This poster contains one of the early predictions of vinash or the catastrophic transition between the Iron Age and the Golden Age "World Almighty Authority Prajapati God Brahma has re-incarnated in ordinary human form along with His 108 most beloved self-conquering luckiest Divine Ones, males and females like Kalpa ago in Bharat on the banks of Sindhu Saraswari Tiver in the year 1937 A.D. and has organised the most supreme Rajsuva Asvamedh Avinishi Gyan Yagya which lasts for 12 years through the Divine power of Supreme 'Aham Brahma Asmi' Faith....the present final International Atomic War, the invention of science, a well as numerous Natural Calamities such as famines, fires, floods, earthquakes, storms, diseases etc shall, within a year or so, become the cause of merging innumerable Kali-Yugi Eastern and Western irreligions or dynastics into Infinite Divine Light like Kalpa ago." May 1950 Baba directs all personal records from Pakistan to be left behind. Many are reluctant to leave their precious diaries, so Baba tells them to bury their books and that these would then be discovered on the path of bhakti and form the basis of the scriptures in the next kalpa. They move with few personal possession, but with their invaluable posters. Om Mandli moves to Mount Abu and leases Brij Koti. Shortly afterwards they move to Pokhran House (Pandav Bhawan). They call the ashram Madhuban, named after the garden where Krishna played in the scriptures. Then in the early 1950s the Beggary Period begins, continuing for around 10 years. Between 1952 and 1958, Shiv Baba is still thought of as thumb shaped. When God (Shiv Baba) was finally understood as a point of light, Baba asked the illustrators to go and put a white point inside every egg shape on every poster that depicted God. By end of the 1950s, it seem they understand Shiv Baba as a point of light. Therefore, the knowledge of the soul as a point of light is also clear. In posters drawn after the 1950s a distinct difference is that Infinite Divine light is replaced by the presence of Incorporeal God Shiva.